Dr. Alejandro Elorriaga Claraco, Director; Dr. Angelica Fargas-Babjak, Chair; Dr. Ravinder Ohson, Lecturer; Dr. Pradeep Kumar, Lecturer; Dr. Mike Prebeg, Lecturer; Mrs. Heather MacKay, PT, Instructor Coordinator, plus over 35 additional instructors. Since 1998, hundreds of physiotherapists have successfully completed the McMaster University Contemporary Medical Acupuncture Program, as part of an elite group of over 2,200 health care professionals from over 15 different countries. 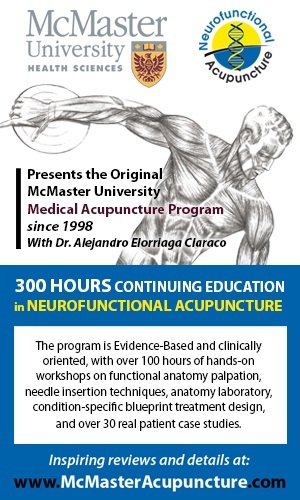 This 300 hours University reviewed and approved Program consists of five live Units (Fri-Sat-Sun) completed within four months, with a concurrent home study portion that includes key acupuncture articles from the medical literature. In each Unit the Anatomy Laboratory session, live patient demonstrations, functional assessment workshops, and daily needling workshops (over 300 supervised insertions) guarantee the successful integration of acupuncture into a physiotherapy practice, right upon completion of the Program.